I'm definitely a Richard Blais fan. I wanted him to win his first season of Top Chef and was very happy when he won the All-Star Season. I also am a fan of fruity-vodka drinks and the one at the end of this article looks very yummy. 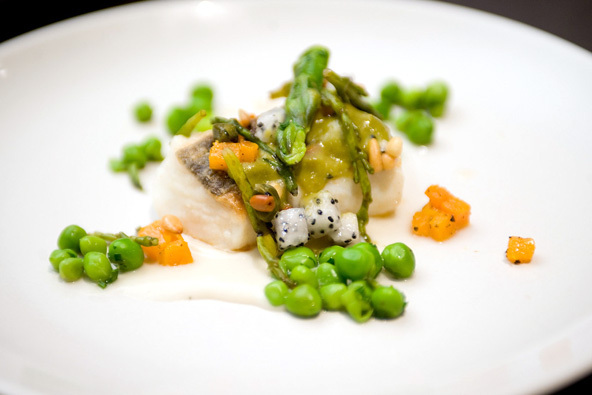 one of the dishes prepared by Richard Blais. Move over, pomegranate. And please give a warm welcome to dragon fruit, fiery red and spiky — and the newest poster child for fruit with health benefits. The fruit first came to my attention earlier this month when it had to be used as an ingredient during a challenge on the opening episode of this season’s “Top Chef: Masters.” Then there was an April 14 Business Week article, “Enter the Dragon Fruit,” about how it was seeping into “America’s consciousness — and the economy.” Last night, the twin forces of alcohol and reality television came together, and the result wasn’t someone getting kicked off “The Real World” but the unveiling of Skyy Vodka’s newest infused flavor. If you guessed dragon fruit, you’ve been paying attention! The coming-out party for Skyy Infusions Dragon Fruit featured six cocktails mixed with the new flavor and paired with a dinner menu prepared by Richard Blais, who won the all-star edition of “Top Chef” last month. The event began with appetizers and a trio of cocktails: the Blaisin’ Dragon, the Red Dragon and the Dragon Fruit Sparkling Seduction. The winner was the Blaisin’ Dragon, with a slice of seared pineapple, which was the perfect refreshing spring drink. 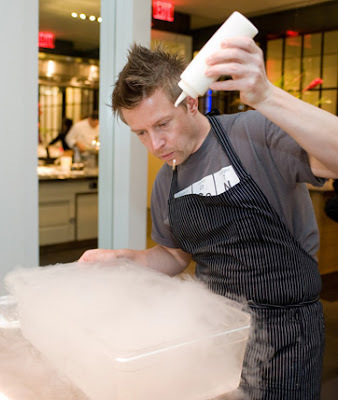 As the cocktails were sampled, Blais worked the room, overseeing volunteers from the Culinary Institute of America, his alma mater, and demonstrating one of his favorite tools of the trade: liquid nitrogen. The cryogenic fluid, with its waft of mist, looked even more like something out of a mad scientist’s lab in person than it does on TV. Blais explained that because it is so cold, you should never put your fingers in it (and he did) or place it on your hair (and he did). Perhaps that’s the grooming secret behind his signature spiky coif, which, he confessed, was vaguely reminiscent of the dragon fruit itself and, maybe, why Skyy offered him the job. He then demonstrated how he used the fluid to make “vodka pearls” for an oyster appetizer that was one of the hits of the night for its clean and citrusy taste and its presentation. (The shell sat on a small, circular transparent dish on a bed of sand and next to a miniature starfish, which may or may not have been edible.). The event was reminiscent of a “Top Chef” challenge: Blais had to use dragon fruit as an ingredient in each drink and course. The first dish was hamachi (tender) splashed with the flavored vodka (subtle), fried clams (a tad too crunchy) and smoked mayonnaise (delicious). It came with a drink called the Muddled Dragon. The next course was Alaskan halibut with fava beans, browned butter foam and pickled glassworts; the fellow diners I spoke to could easily have had seconds or thirds. This was paired with a cocktail called the Dragon’s Cup. For the final course, the cocktail was the Magic Dragon, which included fresh lime juice, orange curacao, kaffir lime leaves and vanilla bean. And the crowning moment was dessert: a wonderful corn bread with candied dragon fruit and pistachio ice cream. Bravo, Mr. Blais! Muddle fresh pineapple with lemon juice and lime juice and orange juice in a shaker. Pour ice in shaker and add vodka. Shake vigorously. Rim chilled martini glass with coarse sugar in the raw. 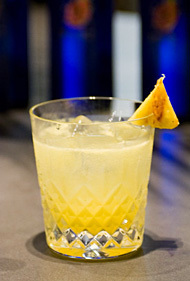 Pour cocktail into glass and garnish with a frozen grilled pineapple wedge and enjoy.